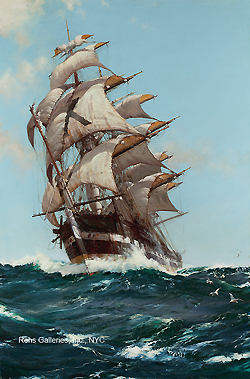 Growing up on the edge of the sea in Southampton, Hampshire, Montague Dawson spent his youth learning about shipping, sailing and fishing. His father was a yacht handler and an engineer whose inventions tended to be fanciful rather than innovative. In spite of the fact that Dawson’s father had inherited a comfortable fortune, he managed to spend the bulk of that legacy on his inventions. As a result, the Dawson children’s education was provided primarily by affordable tutors. However, the family’s move from Chiswick to Southampton where there was more affordable housing proved to be a gift for the fledgling artist. His natural talent for drawing—and the lure of the open sea—evolved into a powerful attraction for an artist with very little formal training. At age fifteen, Dawson began working for a commercial art studio in Bedford Row, London where he received an on-the-job education in illustration and poster design. 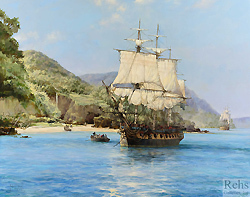 The basic skills that he acquired here would serve him well for the rest of his career; and his exposure to the museums of London introduced him to the work of the Dutch maritime artists who had set the standards for excellence in seascape painting. The excitement of learning his craft, and enjoying the pleasures of London, was inevitably interrupted by the onset of World War I. Dawson enlisted in the Navy and became a lieutenant serving on minesweepers and trawlers. His ability to draw, and his intimate knowledge of ships, led his superiors to assign him the duty of visually recording the war at sea. Many of these drawings became illustrations in the weekly newspaper, The Sphere. In fact, the newspaper published an entire issue devoted to Dawson’s eyewitness drawings of the final surrender of the German Grand Fleet in 1918. The war years were also crucial for introducing Dawson to the marine painter Charles Napier Hemy, R.A. (1841–1917) who lived in Falmouth, Cornwall. Hemy became a friend and mentor to the young painter, encouraging him to continue pursuing a career in the arts. In the immediate aftermath of the war, Dawson returned to London to resume his work as an illustrator, but in 1924, he embarked on a treasure-hunting expedition to the Caribbean. Although sunken treasure eluded him, Dawson’s documentary drawings of the voyage were sent back to London for publication in The Graphic and The Sphere, thus establishing his name ever more prominently as one of England’s best young illustrators. Life in London became even sweeter in 1925 when Dawson married Doris Mary; and in 1926, began a relationship with the fine art dealers, Frost & Reed who would remain his representatives for the rest of his life. He also continued to publish in The Sphere, but increasingly turned his attention to oil painting rather than focusing on watercolors and drawings. During these years, he also began submitting his work to the Royal Academy exhibitions, hoping to establish himself as a serious marine painter as well as a respected illustrator. The decade ended with yet another joyful event, the birth of a daughter, Nyria, in 1928. World War II was only a dark cloud on the horizon when the Dawson family moved into their new home, but after the Battle of Dunkirk in late May of 1940, the English coast became part of the front line, and many of Dawson’s neighbors moved inland. 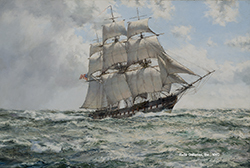 As a maritime painter—and former illustrator of wars at sea—Dawson remained at home, painting current events at the request of Naval officials and continuing to publish his drawings in The Sphere. In addition, he provided working drawings of Royal Navy destroyers from the shipbuilders. 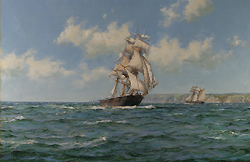 The paintings became part of the British government’s public relations effort, providing precise dramatizations of sea battles to reassure the public of the Royal Navy’s skill and courage. The postwar decades brought ever more recognition. 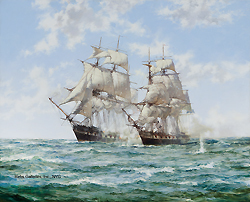 Dawson became of member of the Royal Society of Marine Artists in 1946, and began to exhibit there regularly; and his list of clients grew increasingly prestigious, eventually including the British royal family, and Presidents Dwight D. Eisenhower and Lyndon B. Johnson. 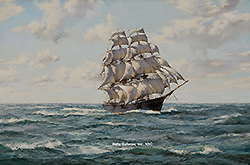 During these years, he also focused his attention increasingly on painting clipper ships, the multi-sailed and elegant vessels that made the New York to China tea trade possible in the middle of the nineteenth century. 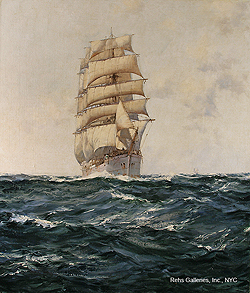 Like most sailors—regardless of whether or not they are also painters—Dawson was enchanted by the romantic history and graceful design of the sleek clipper ships. He painted them in battle scenes, in races, and occasionally silhouetted alone against the horizon almost as if he was painting a portrait of an old friend. 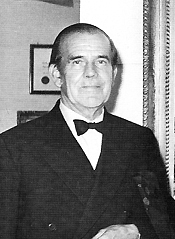 Accolades and commissions continued to flood into Dawson’s studio throughout the 1950s, 1960s and 1970s. He worked consistently, refining his understanding of his subject and spending most of his time in the studio behind his home that he’d built in the later 1930s. 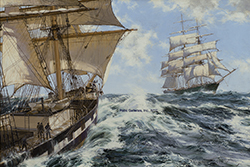 When he died in 1973, he left behind a legacy of contemporary marine paintings unequalled in the twentieth century. [i] For more information about this annual housing exhibition sponsored by The Daily Mail, see Deborah S. Ryan, The Ideal Home Through the Twentieth Century, (London: Hazar Publishing, 1997).